have been remodeling these older homes in huge numbers. about 20 percent in 2007 to over 30 percent in 2016 and 2017.
demand, these units make up a growing part of the owner-occupied stock. kitchen and bath remodels and room additions were especially high among the conversions. to a complete kitchen remodel or room addition. owner-occupied homes has grown from 29 years in 1997 to 39 in 2017.
but just $12,000 if they paid for the repair of disaster damages on their own. 76 percent share for discretionary projects. pay for these small projects out of pocket. as contractor financing or personal loans. Financing varies as well by type of installation. financing is used instead of savings. not yet fully recovered like Las Vegas, Miami, Phoenix, and Riverside. 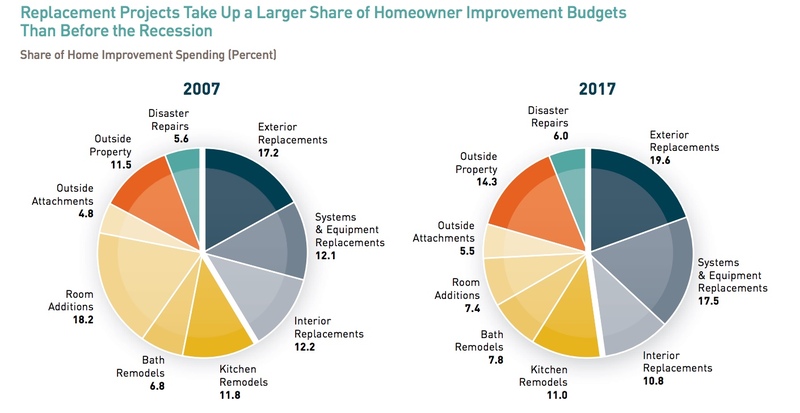 most critical to long-term growth of the home remodeling market. technology that have made telecommuting an alternative to relocation. homeowners increased from 40 to almost 55 percent. bathroom and kitchen remodels or room additions to allow single-floor living. because of the low homeownership rate of younger households since the Great Recession. of spending is expected to remain relatively low. energy retrofits may also be limited. events continues, so will related expenditures increase. preserve and modernize the nation’s housing stock.